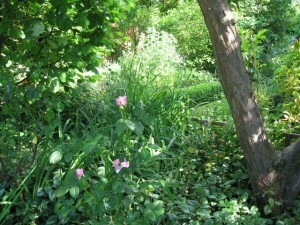 Today is a beautiful day – warm and sunny, with dappled light through the trees and a gentle breeze stirring the foliage. The sights and scents of my garden remind me that Summer is almost here. 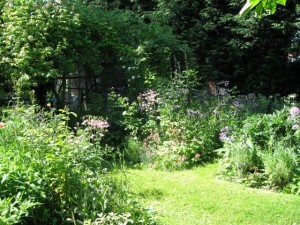 The bees hum as they move among the flowers and there is a general atmosphere of peace and tranquility. 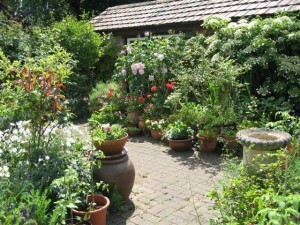 Never mind that there is still so much work to be done to tend the vegetable and fruit crops and keep the flower beds looking attractive – today is a time for enjoying the garden. The work can wait until another day. 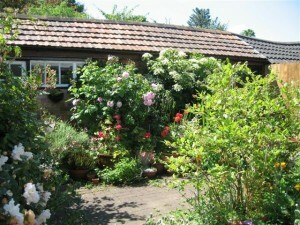 In late Spring and Summer, my workshop becomes increasingly difficult to access, as the roses and other shrubs spread themselves over the path and encroach on the doorway. 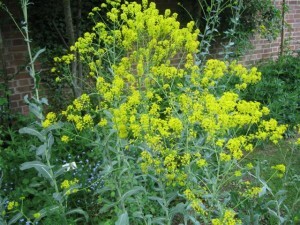 These are my woad plants from last year, flowering and preparing to produce the seeds for next year. On the ground below these plants, this year’s seedlings are growing and developing the dye potential for dye vats later in the year. 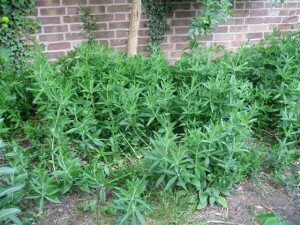 These are the leafy tops of my madder plants, giving no hint of the amazing colour potential of the roots beneath. Madder cannot be described as an attractive plant but, to me, its qualities as a dye plant amply compensate for all its disadvantages as a garden plant. Several weeks ago I was sent some more extracts to try out. This time they came from Debbie Bamford (www.mulberrydyer.co.uk). They were extracts of Brazilwood and Chestnut and also one labelled “Green”. I have tried extracts of brazilwood and chestnut in the past, and also one from another supplier labelled “Green”, but it’s always useful to be able to try others. Brazilwood extract was in fact on the market about 20 years ago, both as a powder and as a type of resin, and I used it then. However, when I supplied natural dyes by mail-order, it was interesting to notice how reluctant dyers were to buy the extracts instead of the dyes in their plant form, even when I pointed out that the extracts would actually work out cheaper because they go such a long way. Now, of course, dyes in extract form have become very popular, although some dyers still prefer to process their own dyes from plant to dyepot. Brazilwood gives lovely reds and a brilliant purple when used with a washing soda modifier and I was very pleased with the results from this extract. I was interested to see that the acidic modifier produced very little change in shade, especially as, when used with brazilwood in its plant form, it usually gives a bright orange. 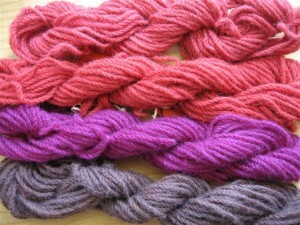 Brazilwood is not as lightfast as the other red dyes, madder and cochineal, but I sometimes use brazilwood over madder-dyed fibres to increase the brilliance of the colours. A little brazilwood extract added to a madder extract dyebath should give good results, although I haven’t tried it yet. Chestnut gives soft brown shades and deep grey when used with an iron modifier. As it is rich in tannin, it can also be a useful plant mordant for vegetable fibres and silk. “Green” gave an interesting range of shades and I was particularly intrigued by what happened with a washing soda modifier. (See photo below). The only thing I find slightly irritating is that when an extract is simply labelled “Green”, or given a name such as “Moody Blues”, I have no idea which plants have been used in its production. Of course, I understand that manufacturers don’t want to give away trade secrets, so I’m prepared to cope with my irritation and use the extract anyway. I do keep telling myself that I should stop asking so many questions and just enjoy using the products but still…………………….. NOTE: A = no mordant & B = alum mordant. In the last few weeks I have been nominated for three blog awards and I really appreciate the generous words of those who have nominated me. I must confess that I don’t know anything about the protocol surrounding such matters and my technical abilities do not stretch to knowing how to “accept” awards. I believe that in some cases the recipient of an award is requested to nominate other blogs for similar awards and I must apologise for my unwillingness to do this, especially if this means I’m “breaking a chain”. I read several blogs, mostly those connected with natural dyes or textiles in general, and I always follow any links I’m given to other blogs; each blog has its own special characteristics and appeal and each has different things to offer. However, I don’t feel in a position to be able to nominate one blog rather than another for an award. I do hope this doesn’t cause offence to anyone but please forgive me if it does. Recently I was looking through The Mulberry Dyer Debbie Bamford’s blog (http://colourextractor.blogspot.com/) and read about the problem of rub-off from indigo-dyed yarns. I should add that Debbie was not experiencing the problem herself but had come across the comment in another blog. Debbie used this comment as an example of how poor dyeing techniques can harm the reputation of natural dyeing, leading to the belief that problems such as rub-off or fading are only to be expected from natural dyes. Like Debbie, I feel situations like this are a great shame, especially as natural dyes, when properly selected and applied, are as reliable as synthetic dyes, if not more so. It can be very irritating to find one’s fingers becoming blue as one uses indigo-dyed yarn. In my experience there are two main reasons why this rub-off may happen. The first reason is that the yarns were not properly cleaned before dyeing, so the dye becomes attached to the dirt or grease, rather than to the fibres, and is then rubbed off as soon as the yarns are subjected to any friction. The other reason is that the yarns were allowed to dry before being rinsed. When indigo-dyed materials are aired, it is important to turn them round from time to time, so no sections dry out before the fibres are rinsed. This is because any loosely-attached indigo becomes more firmly attached once dried and is not removed by rinsing or washing. However, it will come off when used in any way that causes friction. There are other precautionary measures I routinely take. Firstly, as soon as I take materials out of the indigo vat, I plunge them into a bucket of clear water and move them around under the surface for about 30 seconds to a minute. This removes some of the indigo that may be loosely attached to the fibres. As water contains oxygen, it is also possible to leave the fibres to oxidise in this clear water, although they must remain below the surface and it will take longer for the fibres to turn blue. In fact, if patchy indigo dyeing is a problem, this is one way of avoiding it. Also, after airing them, I usually put indigo-dyed materials through a washing-machine rinse cycle whenever possible. Of course, this can cause skeins to become hopelessly tangled if care is not taken, so to prevent this, I tie skeins firmly in a bag or pillow-case before rinsing them. Whatever our preferred dyeing methods and techniques may be, I firmly believe that, as dyers, we are responsible for the reputation of natural dyes and it is up to us to make sure any naturally-dyed items offered for sale, or as gifts, meet the highest possible standards. Anyway, lecture over now! For several years a collection of my naturally-dyed samples has been held at The Royal Institute for Cultural Heritage (www.kikirpa.be) in Brussels, Belgium. This centre covers all aspects of Belgium’s artistic heritage and its laboratories carry out work on conservation techniques and materials, including the analysis of dyes on textiles from all periods and from all over the world. My samples are sometimes used in this analysis work, mainly for purposes of comparison. Every now and then I receive a request for further samples and a few weeks ago I was asked for some more rhubarb samples, in addition to the ones they already have. The samples requested were to show the pinks and greys available from rhubarb root when the colour is extracted in an alkaline solution, using either washing soda or household ammonia. As I couldn’t readily locate any suitable samples, I decided to produce some. I first soaked the chopped rhubarb root overnight in a solution of water and washing soda. By this time the liquid was deep red in colour and I added two alum-mordanted samples and two unmordanted samples. I left the samples to soak for about 24 hours, then I removed them. I dried one pair of samples away from the light and the other pair of samples was dried outdoors in direct sunlight. The samples exposed to the light dried to a greyish shade through a process known as photo-oxidisation. The photo below shows the colours. The upper two samples are alum-mordanted and the lower two are unmordanted. The pink samples were dried away from direct light and the greyish ones were dried outdoors in sunlight. I received a reply today from Karin Tegeler, the supplier of this mordant, and it would seem that I had understood perfectly the information supplied with it. (As all the information was in German, I wanted to be sure that my knowledge of German had been adequate.) The main advantage of this form of alum mordant would seem to be that it can be applied cold whereas, according to the comparative information supplied with this Kaltbeize, the more common alum mordants, such as alum sulphate and potash alum, cannot. (However, my experiments and the experiences of other dyers would suggest that alum sulphate can in fact be successfully applied without heat.) The information sheet suggests that each solution can be used at least 6 times before it is exhausted and that 100gms mordant powder should mordant about 1.5 kilos of fibres. I’m afraid I still don’t know why the ratio between the amount of water added and the quantity of mordant powder used seems to be the crucial factor when measuring quantities. Nor do I know whether its chemical name is aluminium formate, although further searches online for “aluminium formate mordant” seem to suggest that it must be. But Frau Tegeler confirmed that a Kaltbeize mordant solution can continue to be used until there is insufficient liquid left to cover the fibres. However, I still think that 100gms/5 litres would probably be exhausted after 1.5 to 2 kilos of fibres had been mordanted in it, even if the level of the liquid was still fairly high. Frau Tegeler also told me that one customer had left her wool in the cold mordant bath for a year before getting round to dyeing it, but when she did dye it the results were excellent. Anyway, I think I should now stop asking questions and just enjoy using this mordant. Recently I was given a link to a website in Germany, which was offering something called “Kaltbeize AL” or “cold alum mordant”. Naturally, my curiosity was aroused, especially as I had never come across a reference to this anywhere else. So I decided to find out more about this alum mordant, which would appear to be something new. According to the information on the website (www.textiles-werken.de), this form of alum mordant is suitable for wool and silk and is applied cold. Once made, the same mordant solution can apparently be used many times. The instructions seem to imply that the mordant is only exhausted when the liquid level has dropped too low to enable the fibres to be immersed in the solution. I ordered some of this alum mordant from the website and decided to do some tests to compare it with my usual alum mordant. I planned to follow the method given on the instructions accompanying the cold alum mordant and also to try out the same method with the aluminium sulphate I usually use to mordant wool. As far as I was able to ascertain, this mordant would appear to be aluminium formate – something I’ve never come across before. It is apparently made using formic acid, rather than sulphuric acid or acetic acid – hence the name. But that is all I know about its chemical composition so, if anyone knows any more, I’d be grateful for further details. The first batch of fibres should remain in the solution for at least 4 hours and subsequent batches should remain in the liquid for longer periods. I entered three batches, each weighing about 350gms, and the first batch steeped for 8 hours, the second batch for 12 hours and the third batch for 24 hours. However, the instructions are not specific as to timings and only give general guidelines. There is no limit to the length of time fibres can be left to soak, so they can be left in the mordant bath for several days or even weeks. I followed exactly the same procedure with an aluminium sulphate solution, dissolving 100gms alum sulphate in hot water then topping it up to 5 litres. I mordanted three identical batches of fibres in this cold solution, so I could compare the results with those from the Kaltbeize AL mordant. 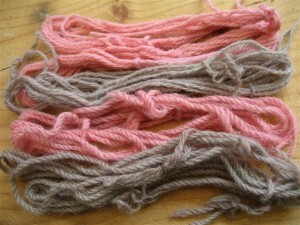 I dyed skeins from each batch from each of the two mordant solutions and the results were interesting. There was hardly any difference in depth of colour achieved from brazilwood when the two mordanting methods were compared. The colour from the Kaltbeize AL mordant bath was very slightly deeper on the fibres from the first batch, but after that the colours from each of the two mordant solutions were virtually identical. These experiments were very useful, as they illustrate clearly that alum sulphate can be used cold, providing the fibres are left in the solution long enough. I think in future I would probably leave the first batch of fibres in an alum sulphate solution for at least 12 hours to start with. The question then was what to do with the remaining mordant solutions. Might there be some mordant potential left in them? As I’m the type of person who finds it difficult to throw anything away, especially if it might still be useful, I decided to add a further 500gms fibres to each solution. I left these fibres to soak for 36 hours. 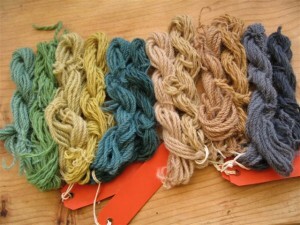 I then tested a sample of each in several different dyebaths and was surprised to find that they dyed well. This indicated that there had been enough alum remaining in both mordant solutions to mordant the added fibres perfectly satisfactorily. Now I have to decide whether to continue adding even more fibres or whether to assume that the alum is exhausted. There are still some aspects of this cold mordant I’m not sure about. For example, would there be any difference in the results between 1 kilo of fibres mordanted for 4 hours in a fresh solution and 250gms of fibres mordanted for 4 hours in a fresh solution? Is it possible that the 250gms batch would have absorbed more mordant because the alum had to be divided between fewer fibres? Would my results have been different if I had added all my 1kg of fibres at the beginning, rather than dividing them into three batches? The instructions suggest that each solution is sufficient for about six batches of fibres, but the weight of the batches doesn’t seem to matter. So does this mean that a 5-litre solution would mordant six batches weighing 1 kilo each? How does this mordant work if there seems to be no relation between the weight of the fibres added to the solution and the weight of the alum dissolved into the liquid? Why is the ratio of alum powder to water so important? Surely the mordant must be exhausted before most of the water has evaporated away? If anyone has answers to these queries, I’d love to read them. If I lived in Germany and had easier access to this new Kaltbeize AL mordant, and if I knew exactly what it is and how it works, I would certainly consider it as an alternative to alum sulphate. However, the high cost of postage to the UK, added to the cost of the mordant, makes it rather expensive. And if I can get similarly good results from alum sulphate used cold in the same way, there would seem little point in incurring the extra cost. But I’d still like to know more about aluminium formate.